Religions mingle,cultures blend.Hinduism, Buddhism,Jainism,Islam,Christianity and above all, HUMANTY- Jharkhand is a conglomeration of these religions -an expression of tolerance-innumerable relics-cave paintings, petrography,stonearts.They all reveal its past,narrating beliefs,customs and cultures of peoples belonging to different linguistic groups. These linguistic groups can be classified into two broad categories.One is the language of the settled Aryans.They speak a corrupt form of the Bhojpuri dialect.This Bhojpuri,in fact,has undergone modifications partly by the influence of the Magahi dialect and the Chattisgarhi.A mix of the two is generally known as Nagpuria. Second is the most ancient languages of the aboriginal tribes.They belong to both the Munda and Dravidian families of languages.ProfessorMaxmuller was first to distinguish them.Sir George Grierson in the Linguistic Survey of India has adopted the denomination introduced by Max-Muller and places Mundari,Birhor,Turi and Asuri spoken in the Kharwari group of the Munda family. Mundari:Mundari is spoken by the dominant Munda tribe.Another tribe Oraon also speak a form of Mundari. Birhor:The Birhor dialect is spoken only by Birhor tribe.Traditionally,they have been nomads.Of late they have been made to settle down in different parts of Ranchi and its adjoining districts such as Chatra,Hazaribagh and Simdega. Turi:TheTuri dialect is akin to Mundari.In a few charecteristics,it follows Santali,a dominant langauge of the tribe known by the same name who inhabit Jharkhand’s Santal Pargana division. Asuri: It is a dialect of Asur.It is now becoming extinct.Closely akin to Asuri is Korwa,a dialect spoken by the tribe called Korwa. Kharia: This dialect also belongs to the Munda family.It has largely been influenced by the languages of the Aryans. Kurukh: It is the language of the dominant tribe called Oraon who belong to the Dravidian family and includes all the languages of Southern India. Scripts: The Deva Nagri(Hindi)is in vogue.Even in the state government and the Christian Mission run schools,children are tought through the medium of Sadri and script used in Deva Nagri. Jharkhand possesses remnants of numerous pre historic stone implements.Its monuments,some of which are credited to the Asuras by the Mundas,yielded such as mixed assorments of finds as polished stone tools,Carnelian beads,wheel made pottery,copper and bronze objects,copper and bronze ornaments and even iron slags,that historians have not been able to date them to any one age. Although relics of Palaeolithic period are not so well marked,there appears to be abundant relic of the Neolithic period.No scientific historical works are available and as such it is believed that archaeological excavation and exploration of all the ancient sites may furnish valuable data for pre historic period. The first recorded discovery of stone implements appears to be one of a beautifully made solitary stone celt found by Professor Valentine Ball at the foot of a small hill near village Buradih falling under Tamar block in Ranchi district in 1867.The finds of WHP Driver,consisting of a few small stone arrow-heads,both of leaf –shaped and chisel-edged patterns,polished celts,cores and flakes and a number of stone beads have been described by Professor J.Wood Mason. Microlithic tools and dolements have also been discovered in the valley of the Koel and the Damodar rivers showing similarity in cultures of the Asura and Munda tribes to the cultures of the Indus valley civilization.SC Roy has given exhausitive list of finds from the Asura sites of South and North Chotanagpur divisions and has endeavoured to prove that a part of this part of Jharkhand belongs to the same age of culture as the Indus valley. Itkhori, a village that lies north of Hazaribagh,16 Km past Chouparan,is a wonder village. In one of the temple room here lies a few hundred pieces of stone sculptures,a treasure house in itself,revealing the influence and happenings during the Pala and the Gupta periods.The workmanship of the statues at Maa Bhadrakali temple complex, built during the 9th century,is simply superb. The Shivalinga at the adjacent temple has 1008 lingas sculpted on it.As many as 104 Bodhi Sattvas and four principal Buddha images on each side are sculpted in the nearby stupa like ensemble. Close to this spot is a stone-slab bearing foot-prints, believed by the Jains to be those of Sheetla Nath, the 10th Tirthankar, who was also said to be born nearby Bhadrapuri in the Kalhua Pahari. Different religions and cultures meet at Itkhori whose name also has a legend connected to Buddhism. When the aunt of Lord Buddha could not distract him from meditating she gave up, goes the legend, saying ItiKhoyi (lost here) thet eventually distorted to become Itkhori . Much before today’s multiplex concept, someone had conceived an idea. The executing of a religious multiplex at an obscure place called Dulli, near McCluskiegunj.Though unfortunately it was not completed and the complex now holds only a temple and a mosque, leaving the gurudwara and church undelivered, the tolerance and respect the planner had shown to the religions and their followers deserve much credit. In Ranchi, the temple on top of the Ranchi Hill,known as Pahari by locals, is ordinarily known as a temple dedicated to Lord Shiva that draws visitors daily.Swamp of pilgrims march to the temple during the festivals such as Shivaratri and during the month of Shravan.Even adding the patriot’s mark,each Independence and Republic Day,the national tricolor is hoisted atop the temple as a mark of respect towards those who sacrificed their lives during the freedom struggle.Many freedom fighters were said to be put on the gallows that used to be on top of the hill.When India gained freedom,the residents of Ranchi,decided to pay respect to these martyrs by hoisting the tricolor on top of the hill. And the tradition goes on…A unique gesture at a Shiva temple indeed. Beyond its fascinating landscape, history whispers in the hills and temples. It does tell the tales of the people who built them in Jharkhand. Kalhua Pahari in Chatra district is one such hill where all the three religions- Hinduism, Jainism and Buddhism have left impressions in the ruins found in the area. The Durga temple is an old structured building where the Goddess is worshipped as Kaleshwari. The Jains visit this place with reverence as their tenth Tirthankar; Sheetalnath is believed to be born in the area. A petrographof 1386 B.C. hints about the historicity much prominently. At Guhipal village in Baharagora block of East Singhbhum district, recent archaeological excavations revealed existence of a civilization dating back to 10th century B.C. Brick structures, artifacts and coins recovered during excavation work along the bank of Subarnarekha river suggest a civilization began there around 10th century BC and continued till 12th century AD. Once the excavation is complete, more starling facts are likely to come to light. REPELLING THEORIES- No one knows for sure if the ancient man here had seen dinosaurs. But some of the cave paintings found in the state suggest existence of such animals that might have inhabited the region in the distant past.Stone-art,cave-paintings and petrography also hint at a civilization that once existed here, be it contemporary of Harappan civilisation or older. Whatever it may have been, leaving that to the pundits to ponder over,one can have a look at some of those expressions of the ancient people of Jharkhand. Some of the sites where such relics are found are in Chatra, Garhwa, Hazaribagh, Giridih and Koderma districts of the state. Most prominent site is at Isko village in Hazaribagh district that lies about 45 Km south-east of the district town. Besides human and animal figures there are some geometrical designs that are attractive. There are some hunting scenes and painting of such animals as deer and tiger.Besides Isko, cave painting are also found in Chatra district- in villages such as SaraiyaRaham, Thethangi and Satpahari. In these caves, among pre-historical paintings geometrical patterns are less in number.Animal forms dominate them.On the other hand, among the historical ones, they are found in abundance.At Satpahari, both anthro-marks and zoo-marks are available. Human figures here are rectangular in shape and their hands are raised.In total, about 50 such caves have been discovered so far and possibilities of more discoveries still exist. These paintings give an insight into the traditions, religious beliefs, cultural norms and artistic exercises of people of those periods. 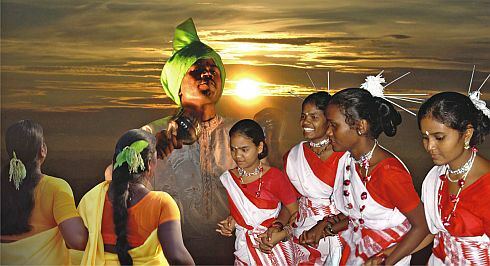 Jharkhand reverberates…be it Baha or Karam- Sarhul or any celebration-Jharkhand reverberates withdance and music-Nature and people sway herein complete harmony. Lived for centuries in complete harmony with nature, the original inhabitants of the state observe festivities and rituals that also involve worshipping the nature in different forms.Some of the important festivals of the tribals are- Karam, Baha, Sarhul and Sohrai. The rituals, dance and music come naturally along with them- making it a part of life. On every occasion,they ease out singing whole-heartedly and dancing to the beating of their indigenous drum-“mandar” or “madal”.The seductive style emerging out of the swaying by the dancers makes it difficult for any viewer not to merge in the troupe -so natural is its invitation and spontaneity. Dance and music are an integral part of tribal life. They promote fellow feeling and community living by bringing people together. Most villages in the state have akharas, the meeting places, where the youth, both men and women, assemble almost every evening to dance to the tune of local music and enjoy on festive occasions. These dances go on for days together. Sarhul is the spring festival where sal tree and leaves play an important role. Sal flowers are brought to sarna, their sacred place and pahan, the tribal priest, propitiates the gods. It is believed that the earth becomes fertile after this festival and agriculture activitity such as sowing is taken up soon after this festival. The Santals, the largest tribal community in Jharkhand, celebrate the same festival as the festival of flowers and call it as “Baha”. Besides sal, mahua flowers are also used by them as an important item for the rituals. Sohrai of the Santals is celebrated with grand festivity. It is preceded by Dansai. Dansai coincides with Durga Puja while Sohrai is celebrated immediately after Diwali or Kali Puja. Dansai is a dance festival, though an elaborate ritual function. A small ritualistic act is observed before the dance begins at akharas. Sohrai is known for the care of domestic animals such as cows and buffaloes. Since these animalsare significant in an agricultural society, taking proper care and welfare of them form important rituals of Sohrai. It is celebrated immediately after Diwali, on the new moon day. In the evening, earthen lamps are lighted. The next day the cattle are washed, vermillion mixed with oil is put on the cattle and they are garlanded. The festivities include such games as bull fights. Karma is another festival that has a close link with the nature. It is observed, hoping prosperous growth of plants and yield.Young girls celebrate this festival for the welfare of their brothers. They decorate a sand-filled basket and some seeds of grams a few days before the festival. This ritual is known as jawa. A cucumber is also offered to the deity. On the day of festival,brothers bring in the branches of Karam tree that are placed in their courtyard.These branches,symbolizing Karam god,are worshipped by their sisters. These are ceremoniously immersed in a local pond or river the next day. The young sing and dance all through the night during Karam, a popular festival of the state. Chhau,a folk dance based on martial arts, flourished here and became established world wide. Seriakela is a school of art to reckon with Chhau dance. Exposed to diverse culture and its natural assimilation into its own,southern part of the state is known as the mother who gave birth to an entirely different kind of dance-form that has martial art as its main element. In a form of this dance,Thakur, an omni potent deity, is performed as a ritualistic mast, during the last days of Chaitra month (April) to invoke blessings of Lord Shiva and Shakti for a bountiful harvest. The dancers normally impersonates a character by remaining inexpressive and mute. Neither is there any vocal accompaniment. Performing to the music of flutes and drums, it is the body language of the dancers that communicates mood. The dance is very vigorous in nature and involves martialart.In the early times mostly soldiers performed it. The presentations are based on stories from epics, mythology, legends and historical events. The dance which emerged in erstwhile Manbhum district spread to nearby areas and ultimately three distinctive schools namely, Seraikela, Mayurbhanj and Purulia grew and established themselves. 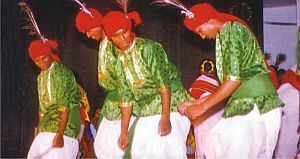 While Chhau is believed to have been derived from ‘chhaya’ meaning shadow or mask, or alternatively from ‘chhauni’ meaning cantonment, the dance form in Purulia remained largely folk in nature but in rest of the two places, Seraikela and Mayurbhanj, it received patronage from local ruling families. Performed by amateurs,the genesis of the Seraikela Chhau lies in the rituals performed during the annual Sun Festival of the region. Strong influences of the principles of Bharatiya Natya Shastra have made it distinct from the other forms of dance.Therefore,its theme,which is based on folklore, nature and mythology,and its choreograph is close to Odyssey in composition and execution. Of the different forms, the SeraikelaChhau is only one of two forms,the other being the Purulia(West Bengal) style. While in Purulia style,Chhau dancers perform it together,Seraikela performers are usually solos or duets.With the individual dancer hidden behind the character represented by the mask, the mood or rasas are expressed through the limbs.Each dance is performed to a unique taal or beat with a style akin to ballet which tests the stamina, flexibility and swiftness of the performer.There are different taals for each type of Chhau dance in Seraikela.